Home > Blog > Get Rid Of Ingrown Toenail Easily ! Get Rid Of Ingrown Toenail Easily ! We’ve all suffered from ingrown toenail, even once in our lives. It’s annoying, painful and it hurts a lot! The best way to get rid of this pain is seeing your general practitioner or a podiatrist. But in between, you can relieve this condition following those easy steps. 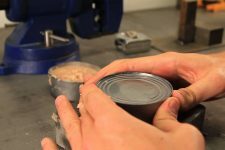 Open a Can Without a Can Opener !